After visiting more than 55 different countries, it’s difficult to narrow down my favorite locations for photography. It really seems that the more I travel, the more places grow closer to my heart – each lending a specific and unique emotional response. Even though I have many favorite locations, Italy still manages to carve out a permanent place in both my heart and soul. Partly due to family heritage and magnified by the infinite wealth of historical locations to photograph, Italy is a must visit for aspiring travelers and photographers alike. Unlike some locations in the world, there is no wrong season to visit. Although it is important to point out that like most of Europe in general, it does tend to be overcrowded with tourism in the summertime. My suggestion would be to visit during the shoulder seasons of spring and fall. This will give you the opportunity for favorable weather for photography and a more personal and less crowded experience. Allow as much time as possible for your trip to Italy. Personally, I could spend three lifetimes exploring this fascinating and culturally rich country. However, since I haven’t figured out the whole ‘immortality thing’ quite yet, I would suggest spending at least one to three weeks to visit only a portion of the country. With a solid month, you could walk away with a decent overview of the entire country from north to south – although it is best to focus on specific regions and plan to make multiple visits. The three best airports in Italy for flight options are Rome Fiumicino (FCO), Venice Marco Polo (VCE), and Milano Malpensa (MXP). Each can be a good option depending on the region you want to visit. I feel a certain affection towards Rome due to the incredible wealth of historical sites. Florence is also wonderful since it was the birthplace of the renaissance. When you get out of the hassle and bustle of the towns nothing compares to the hills and vineyards of Val d’Orcia or Chianti regions in Tuscany or the beautiful coastal villages of Liguria – also known as the Gulf of Poets. Remember that in Italy most of the ancient villages are only accessible by stairs. By the end of a single day you can find yourself tallying tens of thousands of steps. Often these old stair routes can lead to high vantage points and unique photography locations. Italians love their hiking routes, so if you are spending time in the Dolomites, expect to make some short hikes to access the very special photography locations. Even if you are in Tuscany you may find yourself walking through the field to find the perfect point of view. • At the foothills of the Dolomites and in the province of Alto-Adige, there is a little village called Val di Funes. Tucked away in this valley is one of the most classic images of the region featuring a beautiful little farmhouse church and the impressive peaks beyond. • Near Pienza in the Val d’Orcia region of Tuscany you can find the Belvedere farmhouse that is situated as a perfect compositional element. During certain times of year, there is beautiful ground fog at sunrise that can create a mind blowing photographic opportunity. Italy isn’t just about photography, it is also about the experience, the culture, the food and of course, the wine. My suggestion would be to put the camera away every now and then, stop to enjoy the view and sample the local cuisine. A beautiful sunset view of the village of Vernazza – part of the famous Cinque Terre region. I discovered this location by taking the hike towards Corniglia (the neighboring village) and glancing back just before Vernazza fell out of view. I can’t think of many places in the world that offer such a visual harmony for photographers. My advice is simple: enjoy the phenomenal beauty. Oh, and don’t forget the wine! 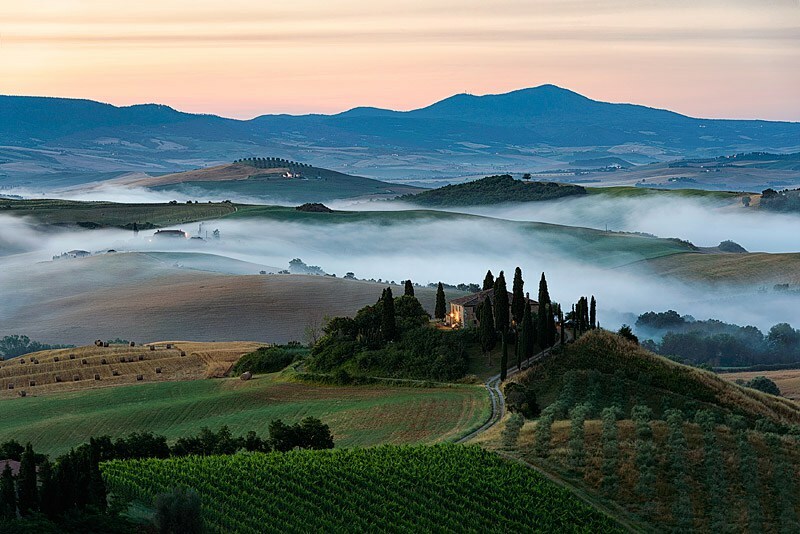 We lead an 8 day annual photography tour to Italy each spring that visits some of the most beautiful photography destinations the country has to offer. 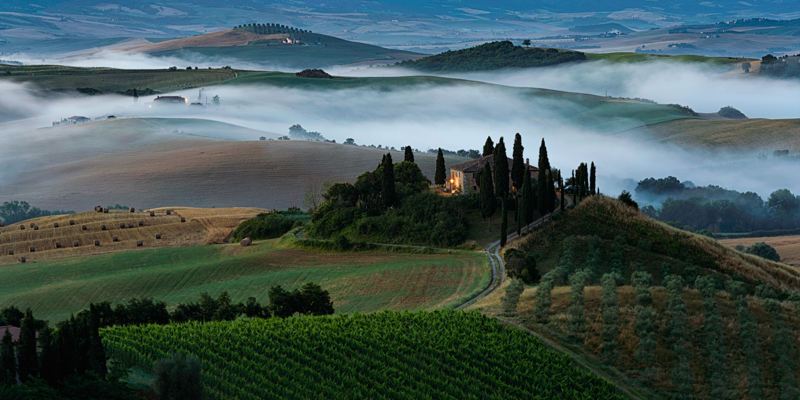 This 8 day tour includes Rome, Tuscany, Florence and Cinque Terre. Great article, thanks for the tips! Being home to the most UNESCO world heritage sites globally, Italy is indeed a fascinating land to visit. However, there are a number of crooks targeting tourists in the country. Do be wary of the fashion guru asking for petrol money, gypsy groups, Rome gladiators, string/bracelet scam, pickpocketing, fake luxury products, rose scam, gold ring scam, unofficial tour guides, pigeon scam and many more! Wow! It’s amazing. I am planning a trip to italy for 15 days in next month and looking for some best holiday home rentals there. Your post is quite helpful. Please suggest some more places, restaurants and rentals.